Samsung is a well-received brand in the market of electronics, especially in the field of smartphone, which is a strong opponent to Apple's iPhone. Samsung Galaxy Note 8, the successor to Samsung Galaxy Note 7, was recently released by Samsung on August 23rd, 2017. It's definitely a thrilling news for all the Samsung Galaxy fans. Will it be a wonderful media player to enjoy Spotify music on? As we all know, Spotify provides streaming music service and all the songs on Spotify are DRM-protected. In other words, Spotify music is limited to be enjoyed on Spotify or Spotify app. Is there any way to enjoy Spotify music without installing Spotify app on Samsung Galaxy Note 8? You can find a definitely positive answer here. To enjoy Spotify music freely on Samsung Galaxy Note 8, the first thing we must do is to remove the DRM from Spotify Music. Therefore, applying a qualitified Spotify Music Converter is vital to the whole process. 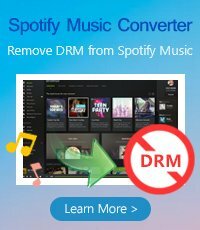 Here we will take the most popular Spotify DRM removal tool - NoteBurner Spotify Music Converter as a typical example to show you how to enjoy Spotify music on Samsung Galaxy Note 8. 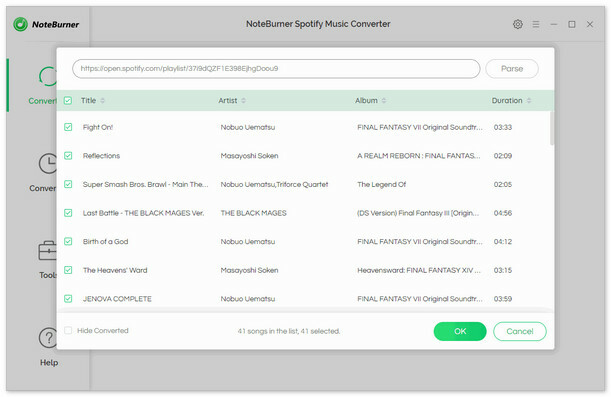 NoteBurner Spotify Music Converter is specially developed for killing the DRM of Spotify Music and convert the DRM-protected Spotify music to DRM-free formats (MP3/ FLAC/ AAC / WAV) at fast speed with lossless quality and ID3 tags kept. It is fully compatible with the latest Windows & Mac OS & Spotify. 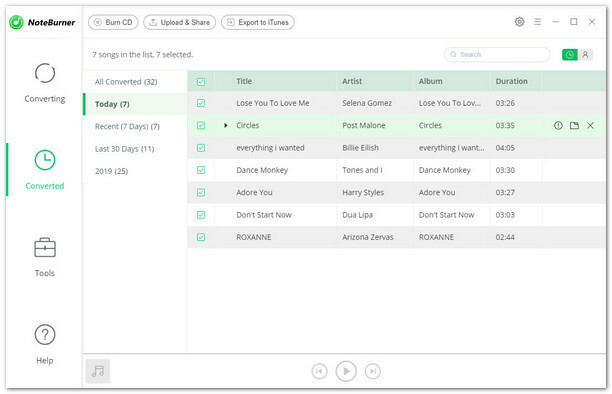 Furthermore, it supports one-click to burn Spotify music to CD and share Spotify music with others via e-mail. Over these years, its' user-friendly design and lifetime free updates & technical support have gained constantly increasing fans. 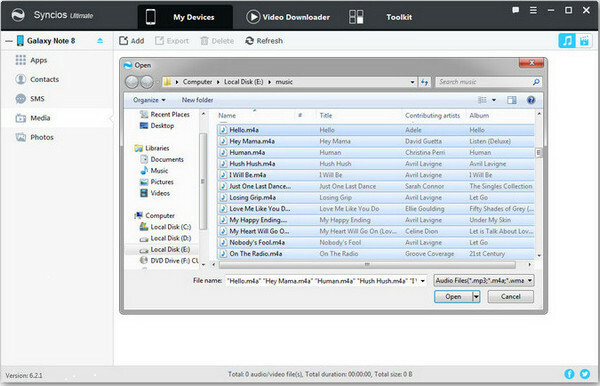 As mentioned above, Spotify Music Converter supports both Windows and Mac OS. Here we will take Windows system as an example to explicitly explain how to remove DRM from Spotify music. Before we get started, please download the Spotify Music Converter fitting in with your operating system. Note: If you are a Mac user, please refer to Remove DRM from Spotify Music Mac for detailed steps. Click button on the upper left, and then a window will pop up and prompt you to copy and paste the playlist link from Spotify. You can also simply drag and drop the song or playlist to the pop-up window. Press button "OK". Click the gear button on the upper right. Here you can choose output format (MP3, AAC, FLAC or WAV), conversion mode (Intelligent Mode, Spotify Record or YouTube Download), output quality, conversion speed as well as output path. After customizing the output settings, click button "Convert". When the conversion is done, all the Spotify songs you get will be in DRM-free format. By clicking button , you can find all the converted audio files. You can also go straight to the output folder you set in Step 2 to look for them. Moreover, click button "Share", you can see the additional functions to burn Spotify music to CD and share Spotify music via e-mail. 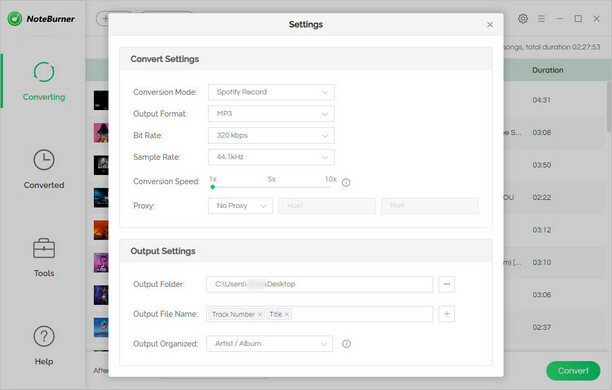 Note:The free trial version of NoteBurner Spotify Music Converter converts three minutes of each audio file only. If you want to unlock the time limitation, please click Buy Now (Mac) / Buy Now (Win) to get the full version of NoteBurner Spotify Music Converter with $39.95. Since all the Spotify music we get now are out of DRM restriction, it's quite easy for us to transfer them to Samsung Galaxy Note 8. The most traditional way is to connect your Samsung Galaxy Note 8 to your PC through a USB cable and then copy all the converted songs to it. Wanna try something new? Here we'd like to introduce the most fashionable and powerful way to manage your music, photos, contacts and other data in Samsung Galaxy Note 8, by a popular freeware - Syncois Free Manager. 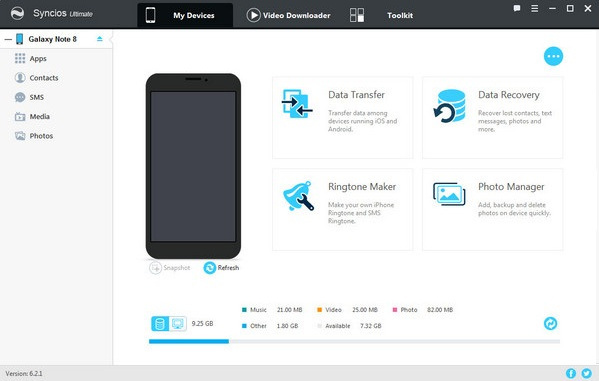 Syncois Free Manager is able to transfer, edit, backup, manage and view Android & iOS mobile data: Music, videos, photos, apps, ebooks, contacts, messages, and etc. It's fully compatible with the two dominant smartphone operating systems – Android and iOS. How can we sync Spotify Music to Samsung Galaxy Note 8 with Syncois Free Manager? Here is a step-by-step tutorial for you. Simply click Media tab on the left panel of Syncios Free Manager. Then click button "Import" to browse music files on your PC. Finally, find the Spotify Music that you want to transfer and click "Open" to import them from your PC to Samsung Galaxy Note 8. 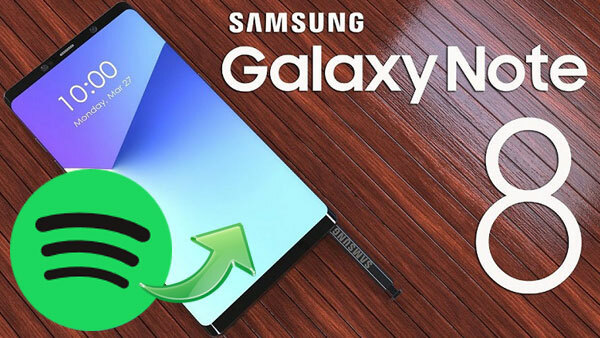 Now you can enjoy Spotify music, free and freely, on your Samsung Galaxy Note 8. Just enjoy yourself! How do you like this tutorial? Welcome to write a review below to share your precious experience with us or any difficulty you meet during the whole process.